FREE POWRTOUCH EVO MOVER OFFER!! ** LIMITED TIME OFFER OF A FREE POWRTOUCH EVO MOTOR MOVER WITH ALL SWIFT ELEGANCE PURCHASES ** THIS IS A DISCOUNTED PRICE ON A BRAND NEW FACTORY FRESH 2019 SWIFT ELEGANCE 530, REDUCED FROM THE RRP PRICE OF £29220. 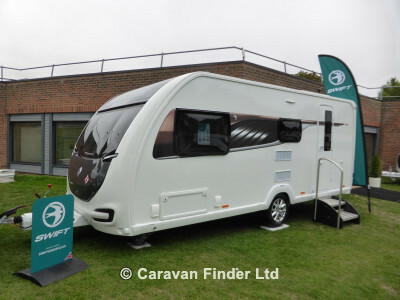 THE FLAGSHIP CARAVAN RANGE FROM SWIFT IN THE ALL NEW SMART 3 TIMBERLESS CONSTRUCTION WITH LIFETIME GUARANTEE ON WATER INGRESS. FINANCE IS AVAILABLE AND WE OFFER FANTASTIC PART EXHANGE PRICES AGAINST RRP. CALL US ON 01257 279921 AND SPEAK TO OUR SALES TEAM TO GET A NO HASSLE BOTTOM LINE PRICE TO CHANGE. AT STEWART LONGTON?S ?WE NOT ONLY SELL, WE SERVICE AS WELL?